September issue on sale today with Ultimate Guide to High End! | What Hi-Fi? September issue on sale today with Ultimate Guide to High End! This month we've got a bumper 2-for-1 special issue for you, complete with 52-page Ultimate Guide to High End. And in the magazine itself we've published our biggest headphone megatest ever! We've tested more than 40 pairs of headphones, from £20 to £1795, including on-ear, in-ear and high-end hi-fi models. So whether you want a budget pair of in-ears to listen to your portable on the beach this summer, or some top-notch cans for your home hi-fi system, you know where to look. Elsewhere in the issue there's a Group Test of 26in small-screen TVs from £230, stylish 5.1 speaker packages from £400-£500 and a six-way test of tablets including the key Android rivals to Apple's iPad2. In Temptations we take an exclusive first look at B&W's beautiful new PM1 stereo hi-fi speakers, and Linn's high resolution one-make Akurate hi-fi system capable of delivering 24-bit/192kHz sound. As for First Tests, there are 15 pages packed with all the latest high-tech kit to enter our listening rooms. That includes Yamaha's RX-V671 AV amp for £500, Pro-Ject's hot-rodded Debut S/E3 turntable, new budget Blu-ray players from Panasonic and Philips, plus 40in and 46in TVs from Sony and Panasonic respectively. There's also a string of new speakers: B&W's classy CM8 floorstanders, Monitor Audio's Gold GX50 standmounters, Tannoy's Revolution DC6 T, Roth's budget Oli 10s and 5.1 packages from Klipsch and KEF. Oh, and let's not forget Rega's compact and cute Brio-R stereo amplifier, Leema's high-end Antila IIS Eco CD player and Audiolab's intriguing 8200CDQ CD player/preamp, all of which get the full test treatment. If you're thinking of installing a multiroom system, then the good news is that you can now do so for less than a grand, as we explain in our Insider section. And for the hi-fi enthusiasts among you, there's a veritable smorgasbord of high-end kit for you to drool over in our special Ultimate Guide. All that, and not one but two competitions, in which you can win a Monitor Audio Apex 5.1 speaker package – one of our 2010 Award winners – and a pair of Lindy noise-cancelling headphone. Click here to enter. 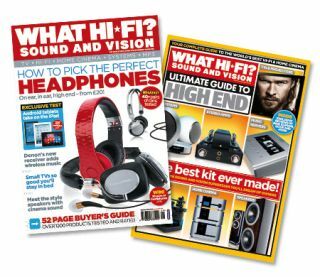 Check out the September 2011 issue of What Hi-Fi? Sound and Vision now, on sale in all good newsagents. Or download the digital edition for £2.99.